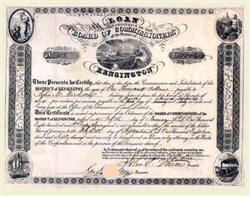 Beautifully engraved certificate from the Board of Commissioners of the District of Kensington issued in 1847. 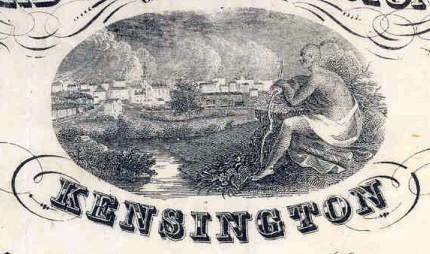 This historic document has an ornate border around it with vignettes of an indian overlooking a town and river from a hilltop, an old sailing ship, early Tom Thumb Train, woman holding the scales of justice and a blacksmith. This item is hand signed by the Boards's President ( John P. Vence ) and Treasurer and is over 156 years old.